A recent article by Tavarish got me thinking: What if leasing a car really isn't as bad as he makes it sound? As I've never leased a car before, a did a quick bit of research, and now I've put together a list of four reasons why leasing a car isn't "a terrible idea." All of your payments are typically lower. Let's say you want a new car that costs $30,000. You have a 10 percent ($3000) down payment, and an interest rate of 2.91 percent (I'm using the nation average for simplicity), if you decide to finance. If you lease, you have the same down payment. There's no trade-in, and no sales tax in the following calculations, because they may vary. The big question is, do you want to lease or finance this new car? With leasing, the monthly payments are typically lower than those with financing. That $30,000 car will cost you about $484 per month (60-month loan term) if you finance, whereas the same car will only set you back about $198 per month (36-month lease) if you choose the leasing route. While the total cost to own may be slightly higher with leasing, the monthly payments will be significantly lower, and often times you can put less money down, too. You won't need to worry about maintenance and repair costs. Nearly all automakers offer some sort of warranty program on their new cars. In most cases, those warranties are fairly restricted to a certain, smaller, amount of years or miles, with one exception being Hyundai's 10-year/100,000-mile bumper-to-bumper coverage. If you finance your new car with a 60-month loan term, your warranty will usually run out before your payments do. However, if you lease your new car for 36 months, your warranty will most likely still cover all repairs and maintenance on the car for the entire amount of time that it is in your possession. 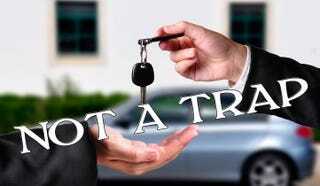 You won't have to deal with trading in or selling your car. After a while, you're probably going to get sick of that car, no matter how nice or how fast it is. Then, you're going to want a new one, but there's a problem: you'll have to get rid of the one you already have. If your car is leased, when the lease runs out and your payments go away, you can simply turn the car back in to the dealership. No problem! That's easy. But if you've financed your car, things get a bit tricky. When you're ready to get rid of it, you have to deal with trying to trade in your car on that new one you've got your eye on, or selling it to get the cash you need. One option makes getting rid of the car you're no longer interested in easy, and the other can just be a pain in your rear end, which I'm sure you don't want. You can always have the latest models or technology. If you're someone who drives their car until it falls to pieces (like my mother), and you don't care about having the latest technology, features, or model of your vehicle (like my mother), then financing, with its longer terms and higher payments may be the way to go. But what if you're someone who does care about all of that (like myself)? That's where leasing comes in. Because the term that you have your car is shorter, you can always have the latest (or incredibly close) to the latest "stuff." Automakers usually redesign their cars after six years, and facelifts usually go on sale at three years into a car's current generation. If you begin your lease on a car immediately after it comes out, and you lease it for 36 months (or three years), you can then get the facelifted model when the lease is up, and then get the redesigned car when that second lease is up. That is, of course, if you stay with the same car the whole time, but hey, that's what brand loyals do, right?